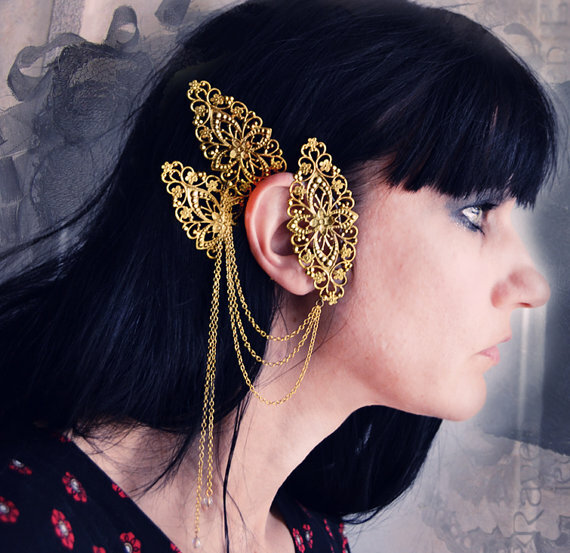 In case you’re not familiar with ear cuffs either, they are different to conventional earrings, as they wrap around bits of your ear without piercings. 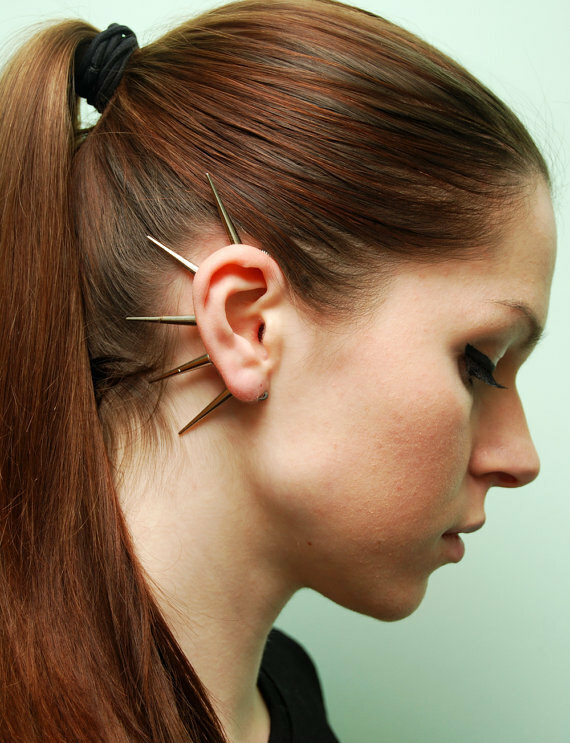 So you can easily swap to a different ear cuff to suit your mood. I have provided a selection for you to consider here. And may I say, it has been kinda creepy to look at so many photos of ears – not our prettiest feature, that’s for sure. I call the first cuff, “Wait, can you hear a peacock?” and it is made by Anna in London. For $31 you can buy your own and freak people out as you wait at the bus stop. Or you might prefer the spiky cuff that Anna has for sale for $18 – this one would come in handy if you are trying to tone down your punk rocker look at work (or if you are trying to convince people you are actually part-human, part-machine). And then there is this gold number, apparently inspired by the movie Labyrinth and made by ravenevejewelry in Detroit. To my uncultured eye, it appears that a fancy bird has taken up residence on this lady’s ear. Either that, or the aliens have vistied and are using her ear to transmit messages back to the mothership. 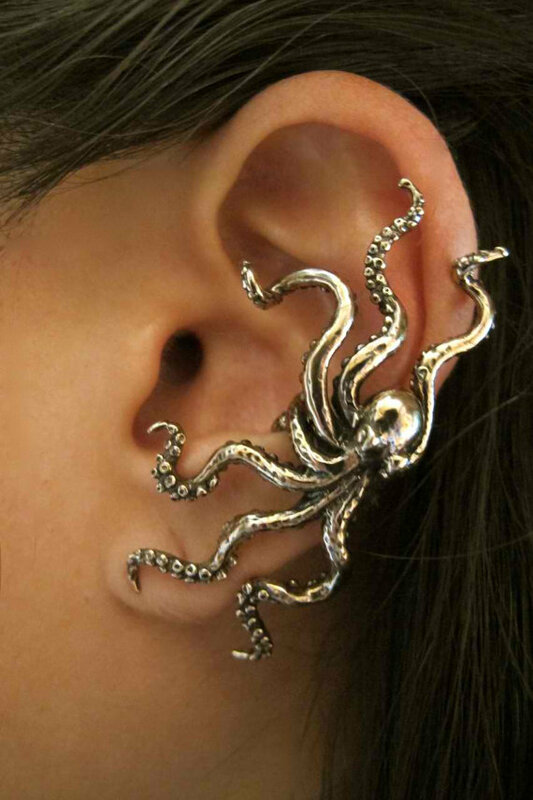 Or maybe you’d prefer a bronze octopus crawling on your ear, from martymagic in Santa Cruz. I’m just not sure how comfortable it would be to have those tentacles tickling your ear all day and am sure your Granny would try to bat it away as with any other eight legged creature crawling on your ear. Eeeeek. But I think my favourite would have to be this black & white feathered number by Mariya in Russia. It’s pricey at $90, but will surely keep you cool in summer and if anyone wants to start an impromptu badminton game, unclip the cuff and away you go. With Mother’s Day coming up in many parts of the world, I’m sure it goes without saying that any of these would make a great gift for the mothers and grandmothers in your life. And I reckon you shouldn’t limit the cuff’s potential by explaining where it is meant to go – hours of fun as Mum and Granny Mac smile politely and try to work out if they’ve been given a brooch or a duster or some sort of new ipod accessory… You’re welcome! Sparks – like you, I’m not sure I really ‘get’ ear cuffs but I do agree that Mariya’s wee feathered number wins the prize for being my favourite. 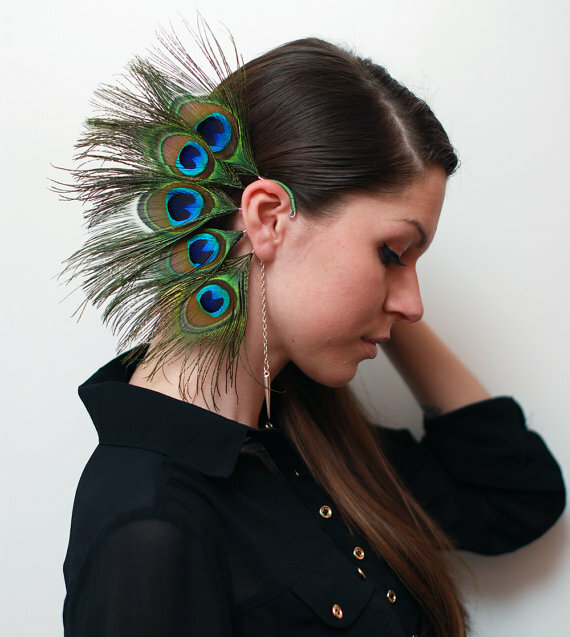 There must be a market if there are 159 PAGES ON EAR CUFFS ON ETSY!!! Who would’ve thunk it? Put those together with the eyelashes – wowee!